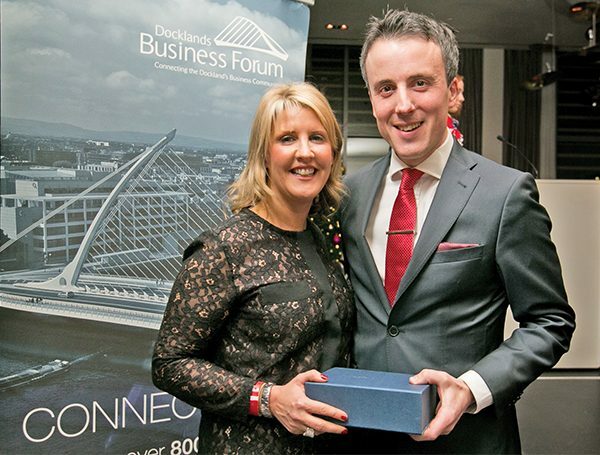 Above: Karina Howley from KPMG, who were winners of the Responsible Business Award, with Michael Noel Harte, Docklands Business Forum Chairman. Late last year saw the sixth edition of the annual Docklands Business Awards, which were held at the Gibson Hotel. The event was organised by the Docklands Business Forum (DBF), an organisation established in 2007 under the auspices of the Dublin Docklands Development Authority. The DBF is a volunteer network with a membership representing over 35,000 employees which each year, as well as the awards, also organises the Docklands Summer Festival, the Dublin Port Riverfest and the Docklands Volunteer Day. Ten companies were recognised and honoured at the ceremony in front of an audience of over 200 members of the local business community. Also present was Regina Doherty TD, Minister of State at the Department of the Taoiseach and Government Chief Whip. Among the winners were worldwide accommodation firm AirBnB, Irish accountancy firm KPMG, new museum Epic Ireland, the Brasserie at The Marker Hotel and start-up Hiri who won awards in the Exporter of Goods or Services, Responsible Business, Innovator, Foodie and Start-up categories. CoderDojo won the public service award for its success in motivating volunteerism in the Docklands tech sector and in inspiring local children to learn to code. In a previous edition of NewsFour, DBF’s proposal to regenerate the three Georgian graving docks were examined. They lie largely abandoned and include the remains of an old Aran Islands ferry, the ‘Naomh Eanna’. Aside from this proposal, Robinson and his team have even greater plans for the waterways that surround the old docks: “We could give the city a more permanent maritime tourism opportunity that would attract yachts from all over the world and bring jobs back and that would have huge potential for significant economic contribution,” he noted.